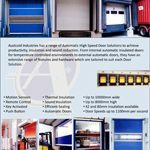 Brochures & Downloads from Austcold Industries - Sectional Doors - High Speed Doors. 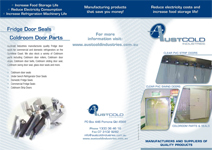 This brochure contains a brief description of our products, including Clear PVC Strip Doors, Swing Doors, Fridge Seals and Coldroom Door Parts. This brochure contains an overview of our range High Speed Doors. All of our High Speed Roll Fast Doors and Sectional Insulated Panel Doors have the most advanced door control feature options, together with safety features. From photo electric beams, to infrared and safety edge sensors, these doors comply with Australia’s health and safety regulations. Our Coloured PVC Strip Doors are a visual feature as shop entrance doors. 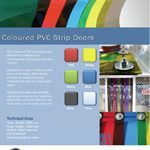 The coloured PVC strips are transparent for safety and consist of UV stabilized and food grade PVC. Constructed using our unique aluminium head section, the PVC strips can be replaced individually with ease. Colours available are Red, Green, Blue, Yellow and Tinted Smokey Grey. Maximum recommended height for coloured Strip Doors is 3000mm. Click on the image or title text to download the file. Material Safety Data on plasticised Poly-Vinyl Chloride, used in Clear Strip Doors, Medium & Heavy Duty Swing Doors and PVC Rolls supplied by Austcold Industries.